Some people know they’re sick. They can feel it, they display symptoms, warning signs emerge, fatigue and discomfort take over. Not me. I am a 38-year-old fitness coach who runs a 6-minute mile. As a wife and mom with school-age children, every day is similar: run errands, consider doing laundry without actually doing it, go to Bible study, think about cooking a healthy dinner and then the inevitable question, ‘What can wait until tomorrow?’, quickly followed up by guilt that I don’t do enough to help my family. The days are different, but the cycle is the same. But late one morning last August, I felt a sharp pain in my stomach, hunched over the kitchen countertop, and then woke up on the floor. As soon as I realized that I had passed out, I knew three things to be true: I couldn’t move, my head hurt (later I’d find out I was bleeding and would need staples), and thank God, my 11-year-old daughter Grace was home. I called out to her to come downstairs with as much gusto as a pregnant cow overdue for milking. When she saw her mother lying on the brick floor, Grace remained calm, offered to get me a pillow to put my head on, and then held my hand. We say our children grow up before our very eyes, but in that moment I saw her grow to the size of a giant. She asked if I was OK, retrieved my phone, and called my husband Jonathan. He came immediately home and drove me to the emergency room. In a span of three hours, we learned that passing out had been an ordinary vasovagal response to being dehydrated and drinking cold water, but also that something was wrong with my heart. After two failed EKGs and an ultrasound, the cardiologist only let me go home on the condition that I would complete a stress test. The stress test turned into endoscopies, and endoscopies yielded to an MRI and then another MRI. 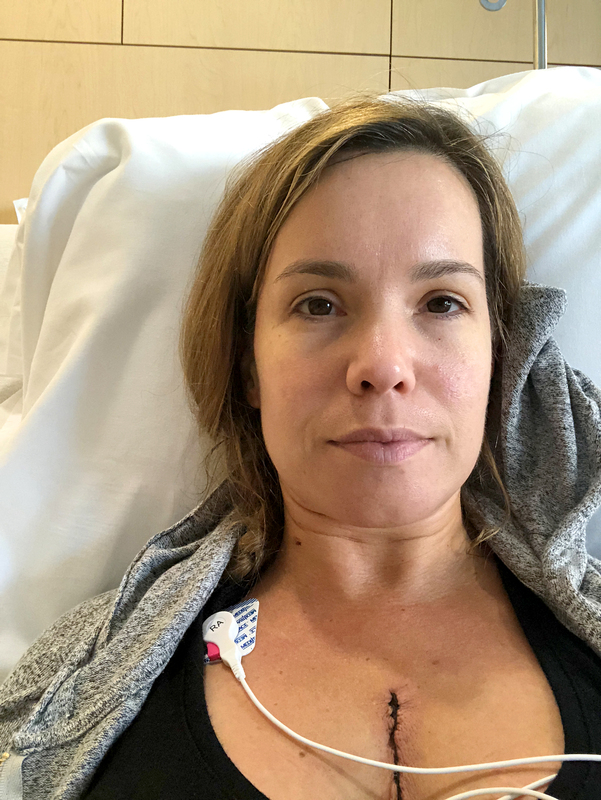 I was diagnosed with a Papillary Fibroelastoma (PFE), a rare but benign tumor of the heart that measured just under 1 centimeter in diameter on the inside of my heart. PFEs are the second-most-common heart tumor, but even so, only one in every 10,000 are diagnosed, or one in every 100,000 depending on the study. If it broke off, I would have a stroke. If pieces of it moved, the effect would be akin to exploding shrapnel in my heart. Even worse, due to the location of the mass, every time my heart beat, the thinly attached mass moved, obstructing blood flow from one chamber of the heart to the other. I was doing everyday life with a metaphorical time bomb ticking in my chest. Within three weeks, I was scheduled for surgery. Every day was a different story, a new test and a different consult. The medical teams all agreed that the only way to fix it was through open heart surgery. My procedure, which took place in September 2018, lasted around two and half hours. Once the surgical team was finished, I was wheeled into recovery while the surgical cardiologist met with Jonathan and my mom to tell them what he found. They had cracked my sternum and a few of my ribs to open my chest cavity, and Dr. Rigby put my heart on a bypass machine. The heart needed to be still if he was going to cut the aortic valve and venture inside my heart to remove the tumor. Once inside, he saw what imaging diagnosed as a Papillary Fibroelastoma—only it was not a PFE. It was a 1 cm calcified black mass that was hard as stone. Mercy. A sheer mercy. I’m alive. The girls get to keep their mother. Jonathan gets to keep his number one cheerleader, and I get to keep living the God-given life that I have. It feels strange being rescued from something from which you didn’t know you needed rescuing. We’ve heard the cliché “the devil is in the details,” but that should be amended to “God is in the details.” From passing out in my kitchen and thinking I just needed staples to right now, God has been in the details. It’s miraculous, the daily miracles we receive when we have eyes to see them. While many who know me know my vices, my imperfections, my propensity to break out four-letter words when I hurt or for sheer shock or entertainment value, and my dark-sarcastic humor, they also know I’m a work in progress. I will always be a work in progress. I believe perfection only happened once, and it happened on a cross 2,000 years ago and was found in a man without spot or blemish. 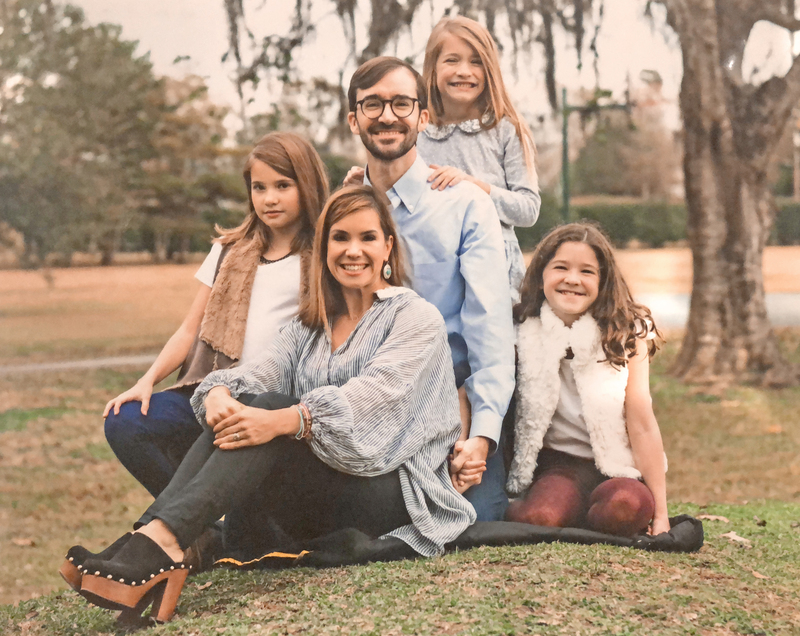 And while I’m always wanting more for myself and wanting my girls and husband to see a larger narrative, that life is not about us, but about the one who made us, I cling to these verses because of the promise that is made in them. I am promised a new heart. I am promised that God will remove my heart of stone. I am promised that flesh, the word made flesh (John 1:14), will dwell within me. In a very real and very literal way, a stone was removed from my heart. Effectually, I have a new heart. And this means freedom. I have freedom to live. I have freedom of change or what fancy church people like to call “sanctification,” the process of becoming more like a saint. Yes, God is in the details, and he loves me so much and has given me the eyes to see how intimately and personally he has loved me by making a silly “life verse” a hinging point of new reality and new freedom. I get to live life and I get to live it big. Big. Abundant love. Click here to read our full feature on women and heart health, with two more first-person stories of surgery and survival.